Hilton Herbs Top Coat is a skin and coat supplement for dogs. Containing 100% pure herb and plant material, Top Coat is formulated to help support skin health and promote a strong and glossy coat. The inclusion of herbs may also support the body's natural immunity and have a soothing effect on skin throughout the year. Marigold flowers, Chamomile flowers, Nettle leaf, Cleaver herb, Burdock root, Dandelion root and Kelp. 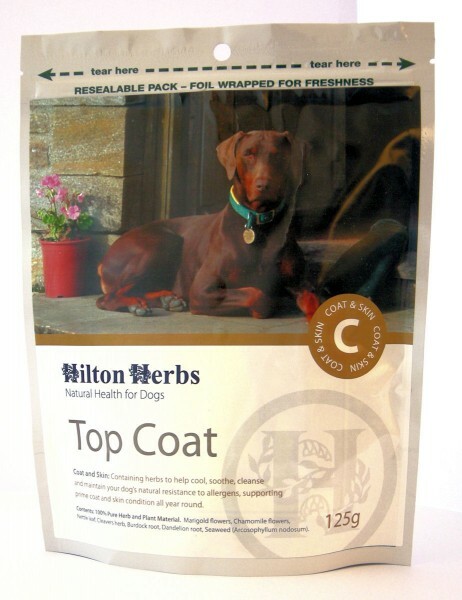 There are currently no questions for Hilton Herbs Top Coat for Dogs - be the first to ask one!